Southwest Watershed Resource Center is offering a new plant-oriented feature that Manager Hilary Hunt describes as a cross between Nextdoor and Craigslist. 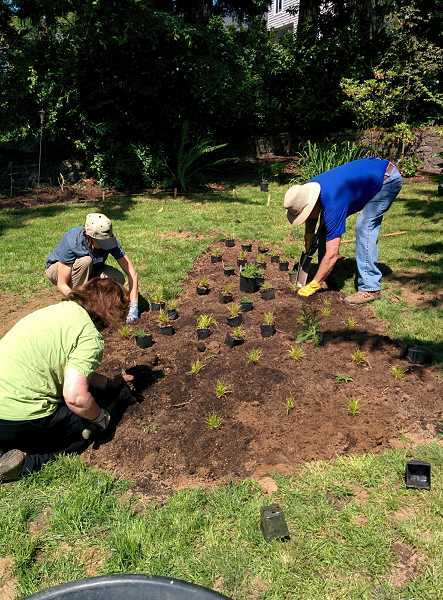 The center's native plant swap allows gardeners, plant enthusiasts and others to share native plants and ideas with each other in order to develop a natural habitat in their backyard or other areas. The idea sprouted when Hunt visited Southwest Portland homes to consult with property owners. She learned that while many people desire native plants, some couldn't afford to buy them or didn't know where to acquire them. So the Watershed Center developed a tool to solve the problem. Users can either post on the site requesting particular kinds of native plants or offer plants to others. The two parties then meet face-to-face. Some use the opportunity to discuss gardening and other pursuits. "When you meet up, it will be at their home or garden, and (people) end up having a pretty long conversation and end up sharing experiences and ideas. That happens best face-to-face. It's great to get in a likeminded discussion group online, but human connection is most powerful face-to-face and the outdoors is a great way to facilitate that," Hunt said. When she first piloted the program, Hunt matched plant seller with plant buyer via her email account, but the site relieves her duties as intermediary. Hunt says native planting is valuable because native plants have evolved alongside their cohabitants for a long time and have grown to depend on them. In turn, a natural environment free of invasive species allows habitats to thrive collectively. "So when settlement and colonization's occurred, a lot of those systems were broken. As we change our ecosystems and introduce invasive plants, those relationships are less intact. It's important because native plants are the food source and shelter source for species that are dependent on them," Hunt said. Hunt also says that native plants don't require as much maintenance and are less burdensome to owners than other plants. And Hunt recommends that plant novices look into native planting. "It's not just for aficionados," Hunt said. "I'm not an expert by any means, but what I've found is they're (native plants) much easier to grow. They aren't as dependent on human caretaking because they're adapted to the climate of a region." So far, only a few people have posted to the site and Hunt says for it to be truly useful, the site will need to garner more attention. "I think what we need to make change on a landscape scale is more publicity and people that have the plants to step up and take two minutes to post it there. A lot of people have plants and are expert gardeners. If you want to participate, make a list of what you want to give," Hunt said. To swap native plants, visit the SWNI Southwest Watershed website at swni.org/nativeplantswap.